Radial wave therapy can be used on soft tissue. 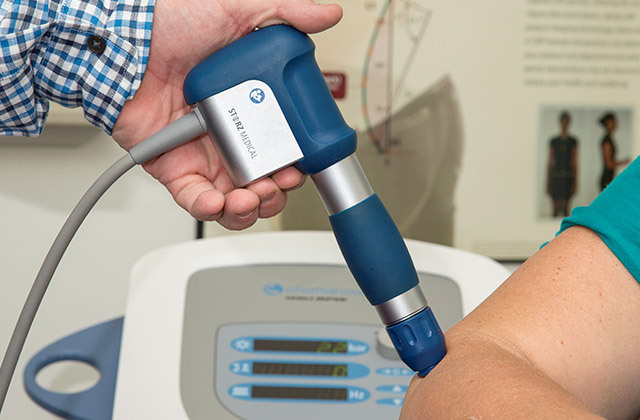 Radial wave therapy (also known as Shockwave therapy) is a multidisciplinary device used in orthopaedics, chiropractic, physiotherapy, podiatry and sports medicine. It is a nonsurgical therapy that is used to speed up recovery of conditions causing acute and chronic pain. The main conditions treated are tennis elbow, golfers elbow, Achilles tendinitis, trigger points, shoulder problems, Hip problems, knee problems and plantar fasciitis. It works by radial shockwaves introduced into the body by means of a freely moved applicator and cover the entire pain region. Radial shockwaves are often referred to as radial pressure waves, which is the correct definition in physical terms. It feels like a very fast deep tapping sensation on the skin. This leads to a cascade of beneficial healing effects including better blood flow, reversal of chronic inflammation, stimulation of collagen and decreases calcium build-up. The primary purpose of Trigger Point Therapy is to reduce the pain resulting from hypersensitive muscles. Identifying trigger points is done by pressing on the surface of the skin and feeling the texture of the underlying muscle. It must be noted that this is not a massage. A trigger point is like a knot that feels like a pea buried deep in the muscle. It is caused by lactic acid, a normal by-product of muscle activity, which sometimes gets trapped in the muscle from physical, chemical or emotional stress. It is often tender and painful. As affected muscles tighten their function and motion are restricted, causing weakness and pain. In extreme cases, muscle cramping can result. Trigger Point Therapy is performed in several ways. The least invasive is by applying direct pressure or stretching of the affected muscle. Deliberate pressure with a thumb, elbow or an instrument is used to release the tight muscle and helps flush out accumulated toxins.